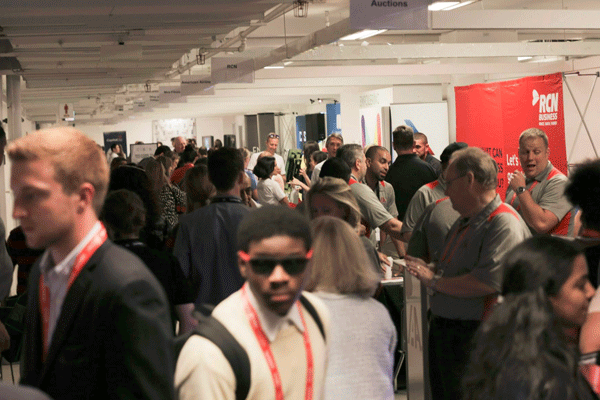 A trade show is a one-of-a-kind opportunity for businesses to strut their stuff and have fun. Employees get to cut through the emails, social media interactions, and the traditional venues to make lasting impressions on customers and peer businesses. Given the performance-like nature of the event, it’s almost as if a trade show is a form of theater—and no good theater performance could succeed without a proper set, supplies, and preparation. At your next trade show, don’t catch yourself on the receiving end of proverbial tomatoes; bring these items to help ensure a resounding applause. “Follow the signs” is a great adage for personal philosophy and trade shows alike—but it’s difficult to follow signs that just aren’t there. When planning for your trade show appearance, make sure you have multiple signs—posters, banners, etc.—that are visible to people from many angles. Draw attention to your booth in a noticeable and classy way. Signs draw attention; proper presentation media helps to keep it there. When setting up your display, be certain to have some kind of engaging presentation media. Slideshow presentations, short video clips, and demonstrations packed with visual aides can go a long way to engaging potential customers. Everybody likes free stuff—it’s a universal truth. Before your convention, reach out to a business that makes customized gifts—t-shirts, calendars, mugs, wristbands, tote bags—and emblazon some with your company’s logo, motto, and color scheme. If your promotional product is good, it’ll draw attendees from all across the trade show and introduce them to what you really have to offer: your service or product. At the end of a busy day, most trade show attendees will be saddled with fatigue, tote bags, and, ideally, business cards. These pocket-sized placards will help cut through the clutter—both of the physical and mental sort—and help clients remember and engage with you long-term. Make sure to keep your business cards to a standard, pocket-accommodating size. Some businesses try bookmarks or bulky postcards; don’t follow their example, as those oddly-shaped items only make a great impression in a trash can. Sometimes it’s not always about what you display, but how you display it. Business cards and promotional items are important; don’t waste their potential with poor organization. Get stands for business cards, jars and boxes for promotional items, and maintain clear placement parameters for items on your table. Otherwise, the trade show’s chaos will overwhelm your setup and turn your booth into an unapproachable pig sty. There are few problems that can’t be solved with duct tape (and other school supplies). Always make sure to bring some kind of Macgyver kit—including pens, tape, rubber bands, stapler, paper clips, scissors, Swiss Army knife, zip ties, thread, etc—to help keep posters in place, table tarps attached, and displays from falling to pieces. Even if you don’t think you need it, bring it. It will help preserve your prepared image in case of emergencies and maybe even save the day for another exhibitor. If your trade show display hinges heavily on technology, bring all the proper wiring equipment. Otherwise, your battery will drop like a stone and outlets will be just one foot too far away. In the worst case scenario, you won’t need your extension cords or power strip and can loan them to another business and make an ally in the process. A trade show is like a marathon. Amidst the churning crowds, you must pace yourself, maintain eyes on the prize, and, most importantly, keep hydrated. Bring the necessary snacks and water to survive the day, in case you can’t make a pit stop at a refreshment table and especially if there is an open bar. If possible, bring extra water bottles to hand out to potential customers. What’s good for their health is good for your business’s. Creating a memorable trade show presence takes planning and preparation. Use this checklist for a low hassle, no worries set up so you can focus on making those connections.